An animated video from the private spaceflight company Blue Origin shows the launch, payload delivery and landing of the company's New Glenn orbital rocket. Blue Origin, billionaire Jeff Bezos' spaceflight company, has secured its first satellite customer for its orbital rocket, named New Glenn. 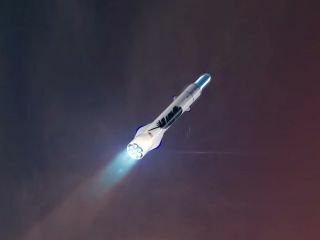 The company also released a video illustrating how the reusable rocket will launch, deliver a payload and land its first-stage booster. The animated video shows a New Glenn rocket lifting off from what appears to be Launch Complex 36 at Cape Canaveral Air Force Station in Florida, which the company is leasing. High above the Earth, the rocket's first stage separates from the payload carrier, which then delivers a satellite into orbit; the first stage then returns to Earth and touches down vertically on a ship's landing pad. "In including New Glenn in our manifest, we are pursuing our longstanding strategy of innovation that drives down the cost of access to space and drives up performance," Rodolphe Belmer, Eutelsat CEO, said in the statement. "This can only be good news for the profitability and sustainability of our industry." The New Glenn rocket is named after NASA astronaut John Glenn, the first American to orbit Earth. Blue Origin has unveiled plans for two-stage and three-stage versions of New Glenn, both with a reusable first stage and an identical second stage. Each of the rockets will be powered by seven of the company's BE-4 engines (the optional third stage will use a BE-3 engine), burning liquefied natural gas and liquid oxygen. The company also has a contract to sell the BE-4 engines to United Launch Alliance to power its new Vulcan rocket. Bezos revealed new details about New Glenn at the Satellite 2017 conference in Washington, D.C., this week, according to an article by SpaceNews reporter Jeff Foust. Bezos said New Glenn would be capable of launching up to 13 metric tons (about 28,000 lbs.) into geostationary transfer orbit and 45 metric tons (about 99,000 lbs.) into low-Earth orbit. That would make the rocket "one of the largest vehicles in service," according to Foust's article. An animated video shows how the Blue Origin New Glenn reusable rocket booster will land on a ship. Blue Origin is also building a 750,000-square-foot production facility for its New Glenn rockets in Exploration Park, located next to NASA's Kennedy Space Center and Cape Canaveral Air Force Station. The company has already made successful test launches of its suborbital New Shepard rocket, which the company plans to use to carry payloads and human passengers to suborbital heights. Those launches have included successful landings of the reusable New Shepard booster.